Today’s Secret Ingredient for Friday Foodie Fix is Chickpeas. They are also called garbanzo beans and in Italy ceci. Chickpeas are legumes. They are round but with sensual curves and a pale creamish yellow color which is nothing like a lemon. Firm texture and a nut like flavor fill your mouth. You can even undress them by taking off the skins. Chickpeas can be purchased canned and dried and are often found in many dishes from India, the Middle East, Mediterranean cuisine and even Mexican meals. Chickpeas are a good source of zinc, folate, dietary fiber, protein and calcium. So what’s not to love about chickpeas? This week I shared two of my favorite recipes using chickpeas, La Cecina and Roasted Chickpeas. I’ve also used them in my Pasta Fagioli, Amazing Toasted Nuts, Falafel, and Tuna Chickpea Salad. Now it’s your turn to share your recipes and ideas for chickpeas. Please link to the recipe page with this ingredient and then link back to this post so people can find more chickpea recipes. 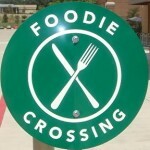 Please see the master page for Friday Foodie Fix with a complete listing of all the past Secret Ingredients and rules. Coming soon a month schedule of Secret Ingredients for those who like to plan ahead! Next week’s Secret Ingredient is …..Plums! Jenn, that is the coolest dish I've ever seen. It looks amazing. Thank you so much for sharing. You know how I love chickpeas! I need more recipes on my blog for them. I find it so important to travel with food but had no idea how much I should have brought. Next time I may pack like Melissa! Glad you liked the bread. We love chickpeas!! The recipe above is one of our favorite, go-to recipes. We also like to use them in our veggie taco fillings. Chickpeas are my easy meat substitution in so many meaty dishes as they provide such substance.